Compact, yet user friendly, the VIA EPIA N700 boasts the latest VX800 unified all-in-one media system processor. The VIA EPIA N700 is a compact, low heat, power-efficient Nano-ITX board, ideal for compact industrial PCs and embedded automation devices. The addition of the VIA VX800 media system processor, an all-in-one chipset solution that provides an extensive feature set while using less real estate, helps to make the VIA EPIA N700 a superb choice for developers of compact systems. 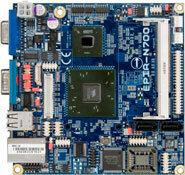 Measuring only 12cm × 12cm, the VIA EPIA N700 board is the lowest profile Nano-ITX board yet. VGA, USB, COM and Gigabit network ports are provided on the board to help reduce system foot-print size and eradicate cluttered cabling for improved air-flow and enhanced stability in always-on systems. The VIA VX800 offers an integrated DirectX9 graphics core and excellent hardware accelerated video playback for MPEG-2, MPEG-4, WMV9, VC1 and DiVX video formats. An on-board VGA port is provided along with support for DVI and a multi-configuration 24-bit, dual channel LVDS transmitter, enabling display connection to embedded panels. The VIA EPIA N700 is available with either a power-efficient 1.5GHz VIA C7 or 500MHz VIA Eden processor, supports up to 2GB of DDR2 system memory and includes two onboard S-ATA connectors, USB 2.0, COM and Gigabit LAN ports. Expansion includes a Mini-PCI slot with an IDE port, additional COM and USB ports and PS/2 support available through pin-headers.